A newly released animated image from NASA’s Cassini spacecraft shows methane clouds moving above the large methane sea known as Ligeia Mare on Saturn’s moon Titan. NASA’s Cassini spacecraft recently captured images of clouds moving across the northern hydrocarbon seas of Saturn’s moon Titan. This renewed weather activity, considered overdue by researchers, could finally signal the onset of summer storms that atmospheric models have long predicted. The Cassini spacecraft obtained the new views in late July, as it receded from Titan after a close flyby. Cassini tracked the system of clouds developing and dissipating over the large methane sea known as Ligeia Mare for more than two days. Measurements of cloud motions indicate wind speeds of around 7 to 10 mph (3 to 4.5 meters per second). 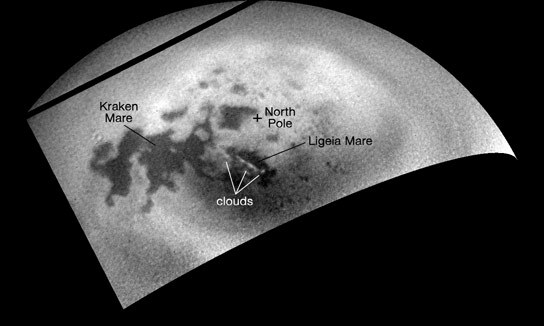 For several years after Cassini’s 2004 arrival in the Saturn system, scientists frequently observed cloud activity near Titan’s south pole, which was experiencing late summer at the time. Clouds continued to be observed as spring came to Titan’s northern hemisphere. But since a huge storm swept across the icy moon’s low latitudes in late 2010, only a few small clouds have been observed anywhere on the icy moon. The lack of cloud activity has surprised researchers, as computer simulations of Titan’s atmospheric circulation predicted that clouds would increase in the north as summer approached, bringing increasingly warm temperatures to the atmosphere there. A year on Titan lasts about 30 Earth years, with each season lasting about seven years. Observing seasonal changes on Titan will continue to be a major goal for the Cassini mission as summer comes to Titan’s north and the southern latitudes fall into winter darkness. The Cassini-Huygens mission is a cooperative project of NASA, the European Space Agency and the Italian Space Agency. The Jet Propulsion Laboratory (JPL) in Pasadena, California, manages the mission for NASA’s Science Mission Directorate in Washington. The Cassini orbiter and its two onboard cameras were designed, developed and assembled at JPL. The imaging team consists of scientists from the United States, England, France and Germany. The imaging team is based at the Space Science Institute in Boulder, Colorado. Be the first to comment on "Cassini Tracks Clouds Developing Over Ligeia Mare on Titan"